CREST Awards: Fun projects for all ages! 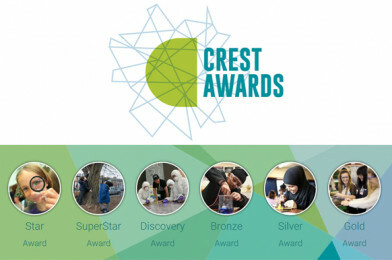 CREST is a STEM enrichment programme for young people that inspires, enables and rewards open ended project work. The levels are non-sequential and can be run by any age over any length of time. Star and SuperStar resources are shorter, teacher-led activities that can be completed easily by primary aged children. From Bronze level onwards, students are encouraged to carry out their own projects. If you run a youth, science or STEM Club, you can get involved too! Typically completed by 10-14 year olds (Key Stage 3), students work collaboratively on the project or challenge(s) in self-managed groups. They record and reflect on their work during the project, using a CREST Discovery passport, and communicate their findings as a group presentation. Typically completed by 11-14 year olds (Key Stage 3), students undertake a project of their choosing. They make decisions about how to progress, write about their findings and evaluate their project in their CREST profile form or workbook. Typically completed by 13-16 year olds (Key Stage 4), students complete 30+ hours project work, which is assessed externally by a trained CREST assessor. At Silver level, students develop and lead the project, consider the broader impact of their work and demonstrate an innovative approach. Students upload evidence of their project, such as project reports, video diaries and/or presentations, and reflect on their work using a CREST student profile form. Typically completed by 16-19 year olds (Key Stage 5), students complete 70+ hours project work, which is assessed externally by a trained CREST assessor. At Gold level, students develop and lead the project, consider the broader impact of their work and produce a unique contribution to their area of study. Students upload evidence of their project, such as project reports, video diaries and/or presentations, and reflect on their work using a CREST student profile form.